I gazed upon the machine cautiously through the stilted light, my eyes catching the glint of copper off its face. It smelled of oil and metal, and had eyes deader than a corpse’s. Marvelous wasn’t quite the word that came to mind. 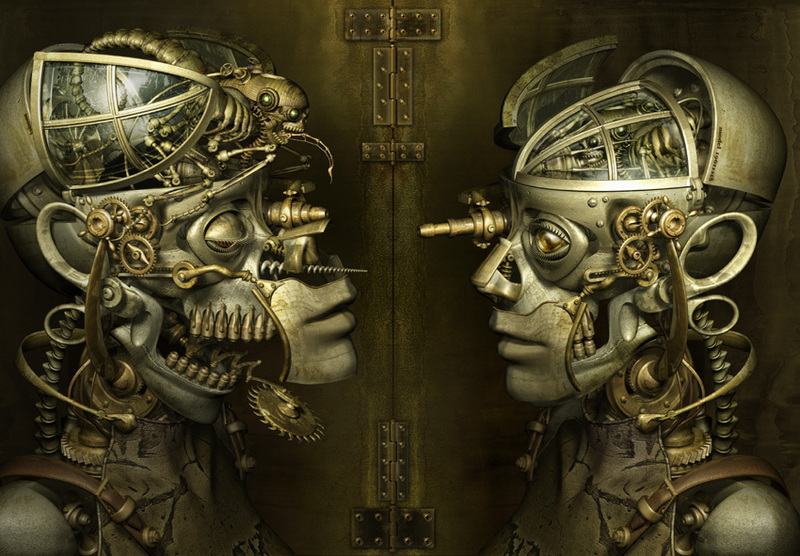 The machine was tall in stature, with exposed gears at the neck and joints, and a ridiculous top hat perched upon its head that I assumed was my father’s attempt to make it look more human. Human. I would sooner compare it with a toaster. But my father had always wanted a son, and he was an excellent clockmaker by trade. Perhaps this would offer him some solace in the fact that he got glued to a daughter who had no interest in befriending androids. He pressed a red button, and at first nothing happened. Then a faint humming came from the inner mechanisms of its chest, and all at once the metal shuddered. A puff of dust escaped from the thing’s mouth, and a bluish glow bloomed in its empty eyes. I jumped back as its neck snapped to attention, and its head swiveled in its socket to behold my father and me. With that, I could no longer stand to be in the room. I gathered up my dragging skirts and hurried up the stairs. Days went by, and my father only grew more attached to Cephas. He no longer worked on his clocks, but spent hour after hour fawning over the mechanical creature, and boasting to anyone who would listen about its infinite database and unparalleled abilities. I avoided the thing as often as possible, but its eyes followed me everywhere, and it always seemed to be around every corner. It was in the workshop constructing perfect clocks with perfect pendulums and perfect glass casings; it was out in the shop charming customers with its perfect articulation and perfect wit and perfect salesmanship. It was perfect in every way. But I hated the thing. Oh, my blood curdled and my fingers clenched whenever I saw it amble up the street, carrying the basket of groceries that Father had bid it to fetch. That used to be my job. I used to be the gopher. Now all I did was sit around, listening to the oohs and ahhs of entranced window shoppers as they admired its metallic sheen and sparkling personality. For God’s sake, it didn’t even have a personality. It was a toaster with a voice box. That was it. And then Father began to speak of constructing more of them, ones that he could sell or rent off to make a bit of extra cash. He even jested about building enough to form a mechanical theatre troupe. When I told him he was being silly, he said, “Oh, but Cephas has an exquisite singing voice, Parthena. He lullabies me to sleep every night! I can bid him to do the same for you, if you’d like…” I scoffed the notion away, but his words did make me think. If he were able to organize an entertaining ensemble of automatons, then it wouldn’t be a stretch for him to assemble an army. My father was a brilliant man with foolish notions. And I think that more than anything, that was what drove me away. I left because I earned a scholarship that would be idiotic to pass on at a school in the country. At least, that’s what I told everyone. I really just wanted to get away, to go to a place where machines didn’t breathe down your neck and ribbons of smoke didn’t lace the sky. My father hardly noticed when I left. He was too busy in his workshop building another friend for Cephas. I didn’t care. Not anymore. The country was a refreshing change of scene, and I was finally able to get the stench of oil and smoke out of my clothes. For years I studied, and over time my father and his mechanical doll faded into the back of my mind. He never wrote, asking after me and my studies. He never cared. After two years, I decided to be the better person and travel home over holiday to visit him. A small part of me was glad to be returning home, and to see him again, but a more dominant portion of my brain was afraid at what I would find when I got there. I boarded off the train at eleven o’ clock, the time when my father would be sending Cephas to prepare his lunch. My boots stabbed the cobblestone road as I headed up the street to his clockwork shop, and my mind reeled in anticipation. Would he have an army of automatons, as I feared? Or perhaps that theatre troupe he wanted so badly worked out, and he was on tour with a circus three countries over. I rounded the corner, and stopped dead in my tracks. The windows to the shop were boarded up, and the scrawling script that once read “Orville’s Clockwork Emporium” was faded and missing letters. At first I didn’t move, I didn’t do anything…but stare and fret that my greatest fears were realized. He was dead. He was dead or lying in a ditch somewhere, dying. Surely, he can’t be genuine… “The clock shop across the road. Right there. With the boarded windows. I’m pointing to it?” That last sentence ended in a sort of question, because the man’s eyes offered no reassurance or familiarity. “Where’s my father?” I demanded. “He…he…he-he-he-he-heheheheheheeeee…” Cephas’ head began to jerk, and the light in his eyes blinked rapidly as he malfunctioned. I gave him a good kick in the side, and he snapped out of it. “Dangerous?” The world around me went still, and it was only the machine. My father was gone…and it was this monster’s fault. But if it had stopped my father from bringing something even worse and more unnatural into the world…then I didn’t know what to think. “Do not go in. No one go in. No one gooooo…” His voice become heavy and sloppy, and I knelt down beside him on the litter strewn ground. Then I flipped the latch on its chest, pressed the black button, and watched as its eyes died. I’m a huge steampunk fan, and couldn’t help myself with this one! I wrote it all in one go, too, so there’s bound to be a few typos here and there.